“Now the mind of the flesh [which is sense and reason without the Holy Spirit] is death [death that comprises all the miseries arising from sin, both here and hereafter]. But the mind of the [Holy] Spirit is life and [soul] peace [both now and forever],” Romans 8:6 (AMPC). God knows a lot more than we do! Romans 8:6 says that I tend to operate in the ways of the flesh. Even though I’m redeemed, even though I’m set free in my spirit, my head has some problems. This verse says that the mind of the flesh is “sense and reason without the Holy Spirit,” and it brings death. In other words, when I do my finances my way, it always ends up bad. When I get a revelation from God on His will for my finances, it always ends up right! So I’m learning through trial and error to do finances God’s way- I’m going to trust Him. Today I want to talk to you about the “trust test.” Tithing is a test. Who do you trust: God or money? It’s really easy as Christians in America to say, “I don’t love my money.” I really struggle with the love of money. It creeps into my heart so often. I made a commitment long ago to pay the entire month’s tithe before the month begins. It’s very seldom that I won’t bring an offering to the Lord every time there is a service or a time of worship. Why? I’m always reminding God that He’s my source. I’m always in warfare against the love of money. The love of money will steal your soul. It will rot your spiritual life. It will destroy your future. The love of money is everywhere in our culture. One of the greatest challenges I have is to be aggressive against a spirit that’s trying to destroy me: the spirit of Mammon. “No one can serve two masters; for either he will hate the one and love the other, or he will stand by and be devoted to the one and despise and be against the other. You cannot serve God and mammon (deceitful riches, money, possessions, or whatever is trusted in),” Matthew 6:24 (AMPC). Jesus said, you cannot serve two masters. Either you’re going to love money or Mammon. Mammon was the demon god that controlled money and the financial systems of the world. In 18 parables out of 36, Jesus talked about money/possessions. He said you’re going to have many tests, and you’re going to have to decide who you serve: money or Mammon. You’re either going to be devoted to one and despise the other because you cannot serve both. Jesus warned us that the spirit of this age is Mammon. Mammon gets inside of our hearts and it’s hard to release it. I’ve been in the ministry for 40 years. As a young man, I traveled in the ministry for 12 years. Let me tell you, those first twelve years was totally a walk of faith! Julie and I slept in other peoples’ houses, in Sunday school rooms, we slept all kinds of places! I lived on the offerings and it wasn’t very much. We averaged about $7,000-$8,000 per year. I knew that if I gave the tithe back to God, He would bless me because I was in covenant with Him. It was a trust test. If I can’t trust Him with my money, I can’t trust Him with my soul. If I can’t trust Him with my money, I can’t trust Him to answer my prayer. If I can’t trust Him with my money, I can’t trust Him that He’s going to lead me through a trial and a difficulty. If I can’t trust Him with my money I have flunked the trust test. It is elementary! God wants your total trust! He’s bigger than the almighty dollar. In Matthew 14:13-21, God fed 5,000 men with a little boy’s fish and loaves. Once it is presented to God, He multiplies it. What you present to God first in faith, He multiplies! Here’s the thing about tithing that is unique: everybody can do it. Even if you make $1/week, you can tithe on it! Nobody is disqualified. When you’re faithful to God, I guarantee that He’ll be faithful to you. He’ll give you benefits a lot of non-tithing Christian friends won’t receive because they’re not applying the same covenant that you have with God. 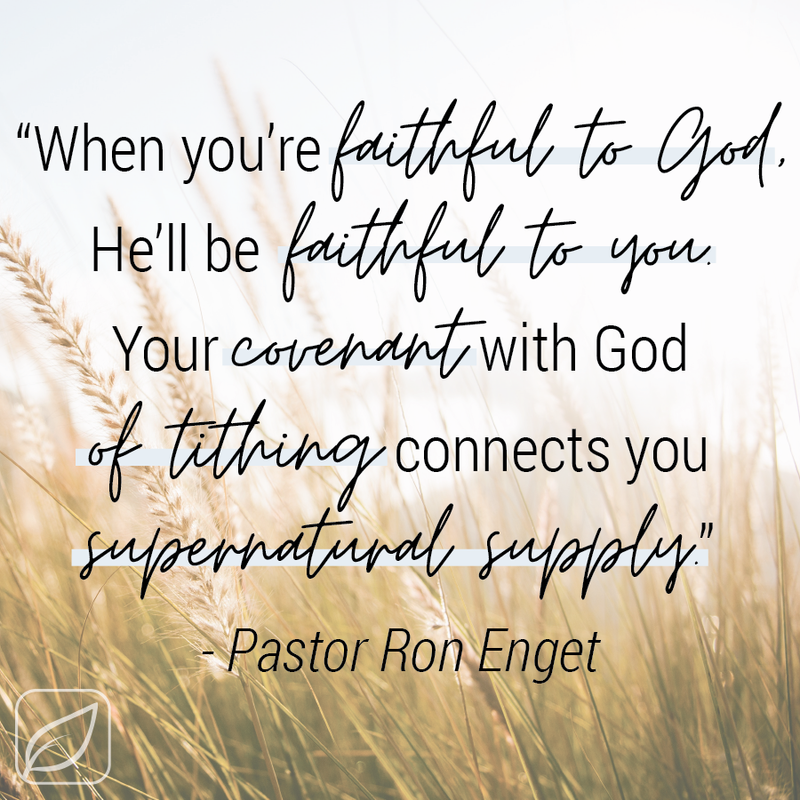 Your covenant with God of tithing connects you to supernatural supply. It connects you supernatural promotion. It connects you to a partner who knows how to do everything all the time. When you trust in God and not in Mammon, you are opening the door to abundant supply!